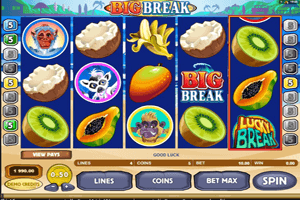 Big Break is a soothing and a calming slot machine that will take players into the beautiful tropical beaches where they can enjoy the sun, the sand and the water. They will also get to accompany a wild group of monkeys who just like to surf and ride the waves. So pack your bags and get ready for one of the most adventurous, exciting and high paying trips of all time. Play Big Break Slot here. The slot machine comes packed with 15 lines that are spread across the 5 reels. The symbol that spin across these lines and reels include tropical fruit such as mangos, kiwis and coconuts as well as the wild pack of monkeys. The Lucky Break symbol is the game’s wild icon. This means that the symbol acts like the joker in any deck of cards, it will substitute for any other symbols whenever it lands anywhere on the reels. It will also multiply any winnings it helps in achieving by a 2x multiplier. The Big Break symbol is another wild icon that can only substitute for the pack of monkeys symbols. The Munky Wax symbol is the scatter icon that will enable players to enjoy 15 free spins on the slot machine when three of them land anywhere on the lines of the game.